Each wall of the living room features its own eye-catching style of art, from an 8-foot-high, four-panel painting of figures and nests by George Marks and Lisa di Stefano to a pair of old-world intaglios and an abstract work by Lynn Sanders. The sofa and chairs are from Dixon Smith Interiors. Photos by Melissa Oivanki. 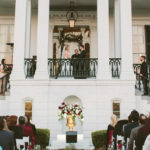 Their heads were shyly turned away, but the two life-size figures caught Lucie Kantrow’s eye as soon as she walked into the room. Kantrow, a lifelong art lover, was captivated by the colors and composition of this massive four-panel painting by south Louisiana artists George Marks and Lisa di Stefano. She didn’t hesitate. Today the collaborative painting is one of the first things visitors see when they step through the newly added French doors into Lucie’s renovated cottage in the Webb Park area. This is a home where art serves as both scene stealer and conversation starter, whether with its size like the Marks/di Stefano piece or with the personal stories that exist behind each image. Sutton Miley drew up the plans for Kantrow’s cottage renovation. New landscape elements including a low boxwood hedge, sasanqua camellias, and Japanese yew are the work of Steve Rowley of Hydro-Scapes. Growing up just a few blocks away, Lucie was frequently surrounded by art. 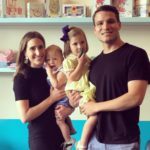 Her mother Gretchen is an accomplished painter, and Lucie and her sister attended art camp and took lessons from well-known local artists Libby Johnson and Nancy Smitherman. 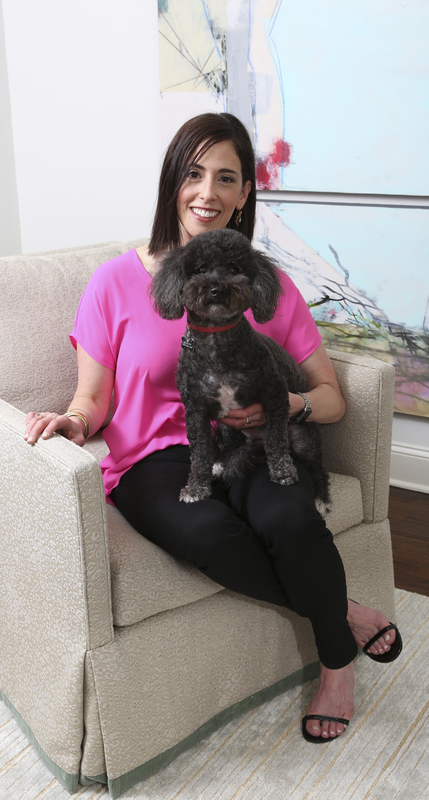 Lucie kept up her enthusiasm during college, incorporating visual arts courses into her studies, and though her career today as an attorney might seem to have more of a left-brain focus, she has never lost her passion for the creative. But after a second visit, she began to believe that a few impactful changes—including a small addition plus opening doorways and raising ceilings—could significantly improve the livability of this residence. Armed with plans drawn up by Sutton Miley, Lucie took the leap. 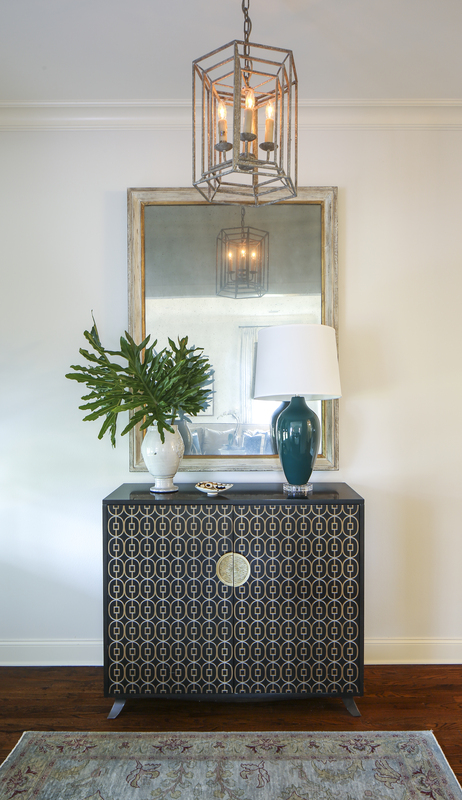 The enlarged entryway is anchored by an Asian-influenced cabinet from Dixon Smith Interiors. 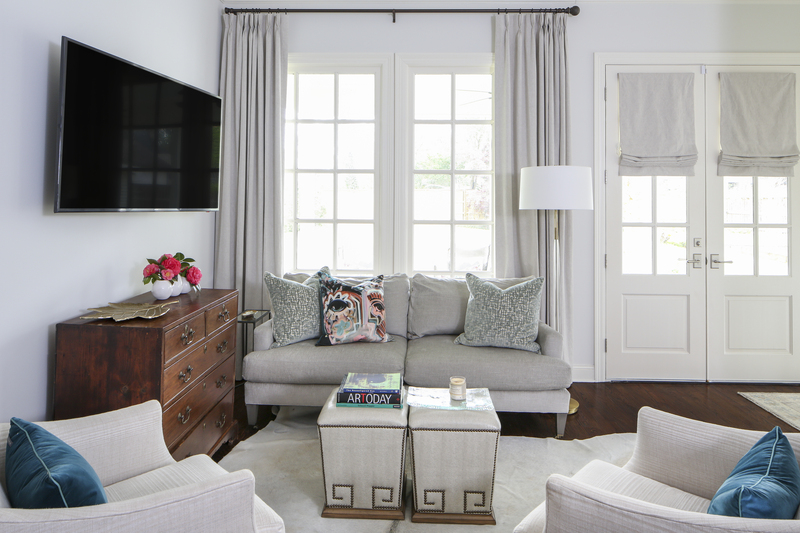 The transformed home proved to be the perfect blank canvas for Lucie’s blend of traditional and contemporary furnishings, many of which are sentimental items that once belonged to her parents or grandparents. Each room is brightened by her growing collection of paintings and mixed-media works by mainly Louisiana artists. 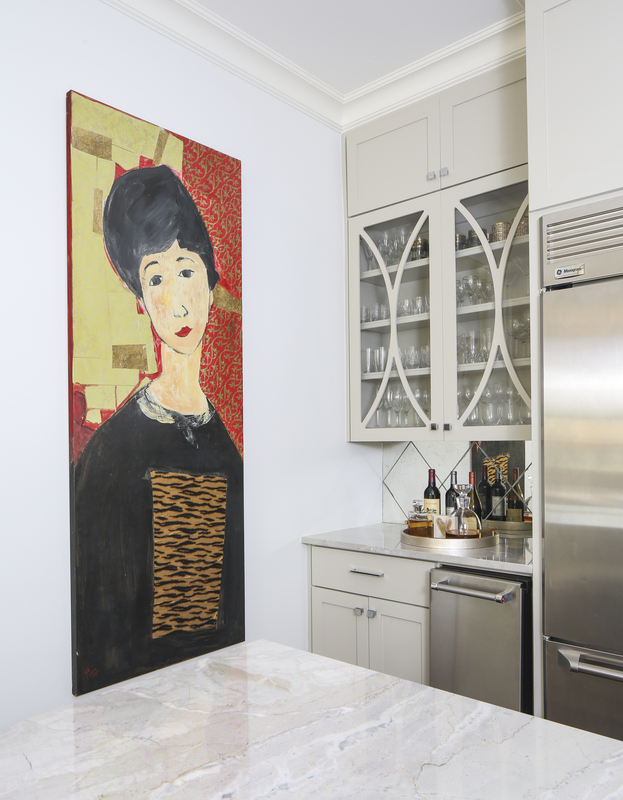 The expanded kitchen, for example, is home to an outsize Tony Mose painting as well as pieces by local artist Emily Monroe Godfrey and Patt Odom of Ocean Springs, Mississippi; an Yvette Owens piece is on display in the new back hall. In the master bedroom, an abstract by Jennifer Roy Oliver and an assemblage of paper butterflies by Caroline Coe hang above eclectic furniture finds from estate sales and consignment stores. 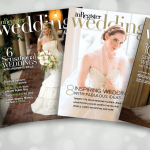 Designer Anne McCanless helped Lucie define the décor, from placing each piece to finding the right finishing touches. 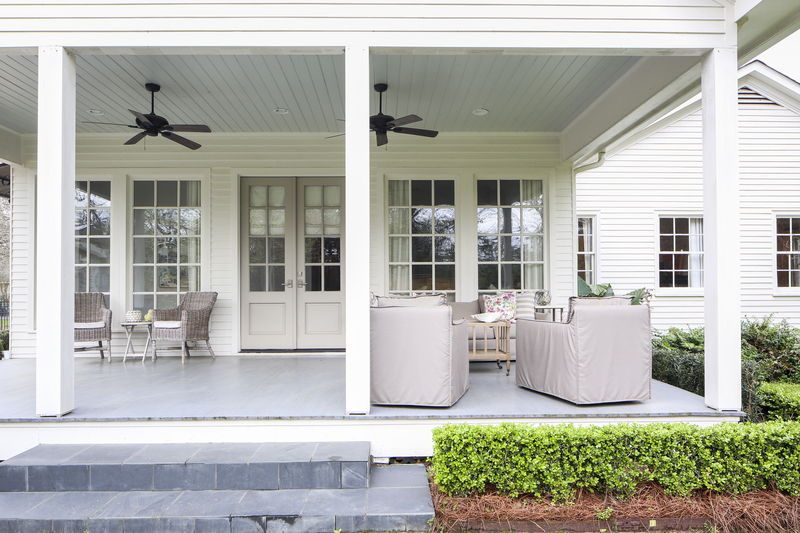 A new back porch provides additional al fresco living space, as well as an area where Lucie can dream up future outdoor plans. Just past the porch steps, a patchwork of grass and stone eases the way into a surprisingly expansive backyard, where old camellia and azalea bushes put on seasonal shows. The former owner tended raised beds in one corner of this private green space, and Lucie envisions adding to her own plantings, which have so far included herbs and tomatoes. Lucie Kantrow and her puppy, Moe, a bichon frisé-poodle mix. The big backyard also comes in handy when Lucie hosts gatherings with extended family. “It’s a good space for my nieces and nephews to play football or wiffleball,” she says. 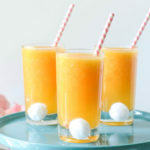 She finds that she’s entertaining more often in this house than she did at the last, thanks to the more functional kitchen and larger rooms that easily accommodate book club meetings or impromptu reunions of high-school friends. 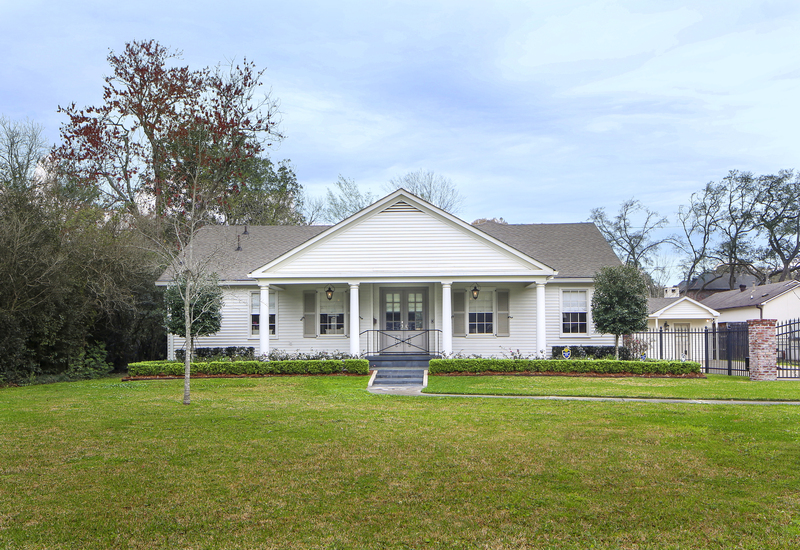 When drawing up the renovation plans, Sutton Miley also outlined a “phase-two” project that includes the addition of a master suite. But for now, this home suits Lucie perfectly, just as it is, just where it is. 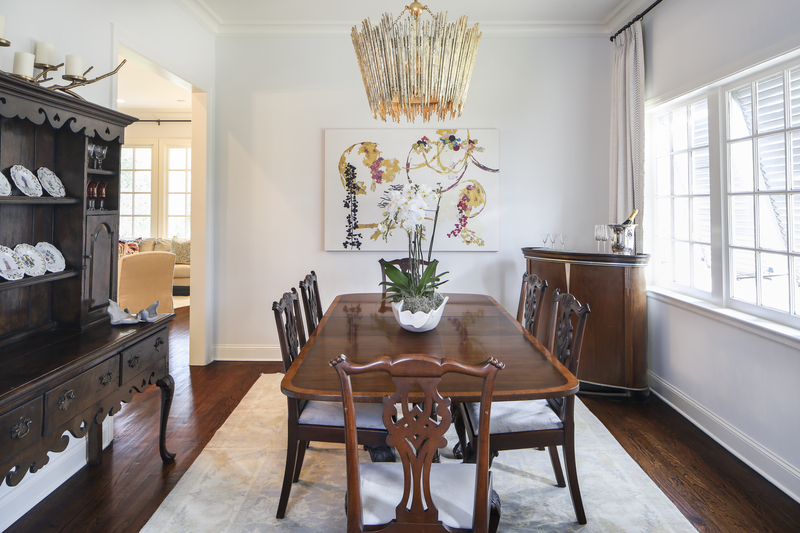 Lucie’s love for mixing modern with traditional is highlighted in the dining room, where her parents’ former dining table and chairs share space with an inherited corner bar and a contemporary light fixture from McMillin Interiors. The mixed-media collage on the far wall is by Seattle artist Rachel Brumer and was sourced from Ann Connelly Fine Art. Art makes a big impact on visitors from the moment they step through the front door into this entryway. The large-scale piece at left is a work on paper by Maine artist Mike Fennelly, who has ties to Louisiana. Expanding the kitchen was one of the major goals of the remodel project for Lucie, who had a “tiny little kitchen” in her previous home. 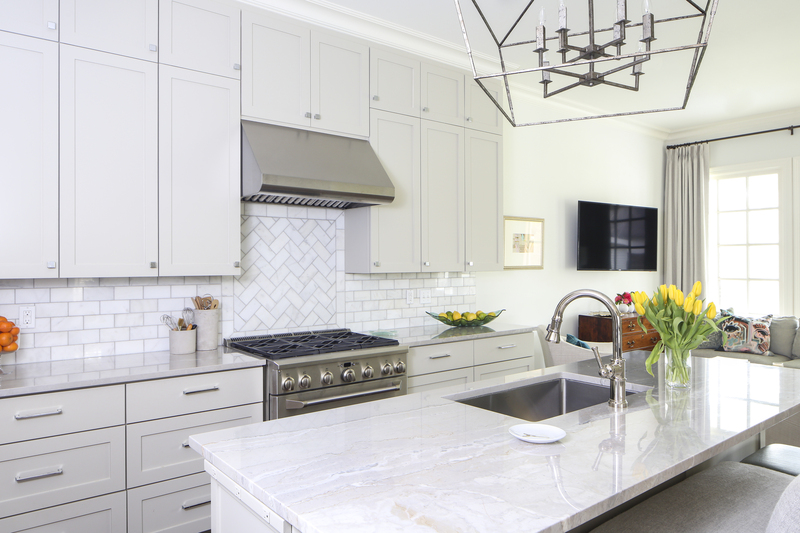 The lightened-up space is clad with Bianco Barcelona quartzite countertops and a marble subway-tile backsplash. 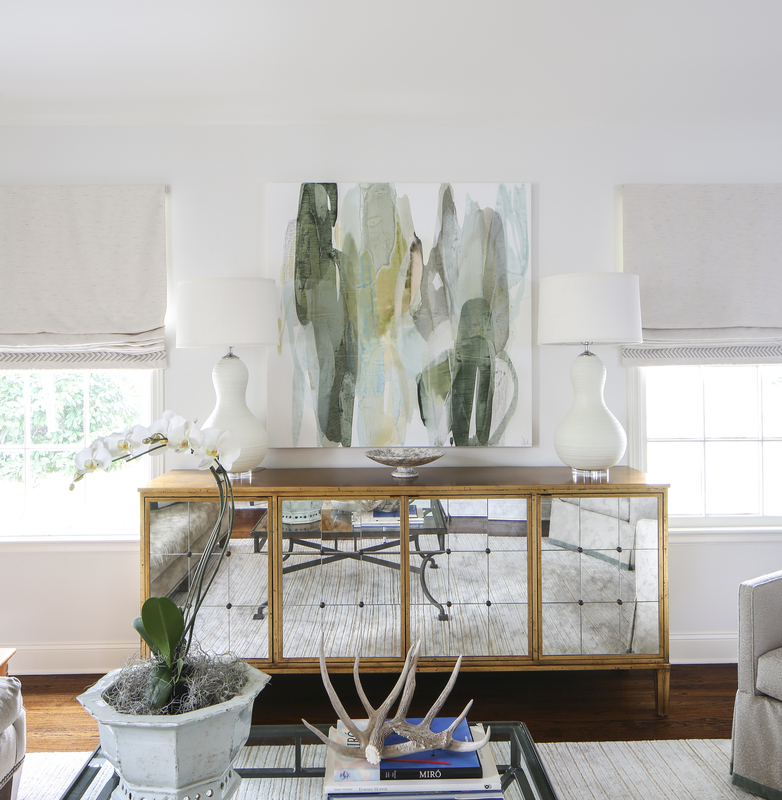 Alexandria artist Lynn Sanders painted the piece that hangs above this mirrored console, which Lucie obtained from McMillin Interiors. A Tony Mose painting Lucie found at the former Mid City gallery Rue Cou Cou hangs in this corner of the kitchen, which neatly houses entertaining essentials. In the cozy keeping area, the cool hues of upholstered seating pieces from Dixon Smith Interiors are warmed by an antique dresser that previously belonged to Lucie’s mother. The lamp and throw pillows are from Texture. 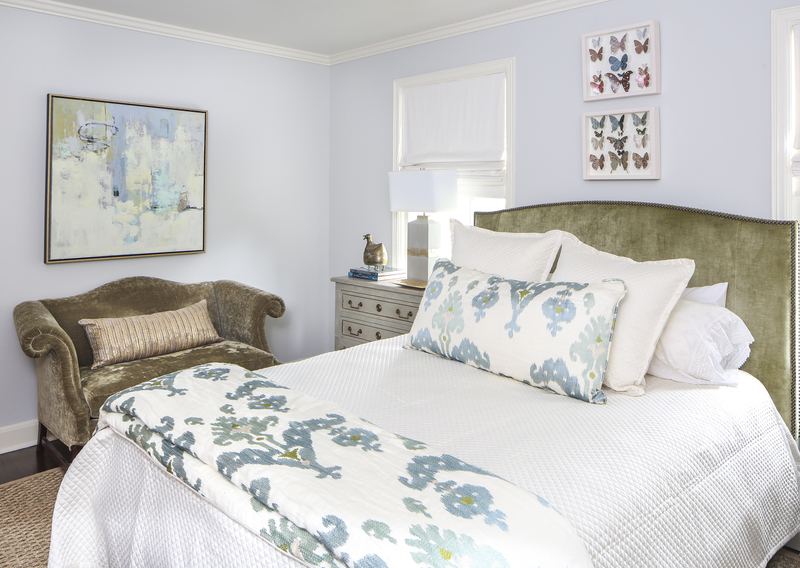 The master bedroom is a pretty place to perch, with its hand-cut butterfly collages by Caroline Coe and an abstract painting by Jan Zhang. The petite loveseat was a consignment-store find. The new back porch provides plenty of additional comfortable space for Lucie to relax or entertain.